Please take the time to read Christine Miserandino’s personal story and analogy of what it is like to live with sickness or disability. 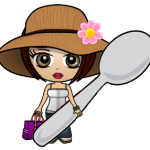 Click HERE to download “The Spoon Theory” in PDF format. *We have English, Spanish, French and Hebrew translations of “The Spoon Theory” available. Now you can purchase small and large poster prints of “The Spoon Theory” from our Online Store! These posters will make a perfect “get well gift, or friendship/ I understand gift.” We also think it would make a perfect addition to any doctor’s office, or support group meeting room. Most importantly, get one for yourself! Oh dear, this brought tears to my eyes. I have fibromyalgia and I know how it goes with people who are healthy. I recently went back for the first time in months (winter is over and that means less pain) to my yoga studio. I talked to the manager there, because we are friends. I told her how difficult it had been for me as of late to just make it out of bed. I apologized for not having been in touch. She chose to tell me that “powerful people don’t make excuses. They are the master of their own destiny.” It took me the entire class to think how I’d respond to her, before I attempted (again) to explain how chronic pain, chronic fatigue and fibro fog feel like. Guess how many times I’ve gone back to yoga since then? Yes, you guessed it, zero! I just found out last summer that I am autistic. Apparently, we have spoons too. Thanks for the explanation. I am glad I came across this. I wasn’t looking for anything health related, but here I am. I don’t have Lupus, but I am not normal, either. Thank you, Christine. I sent this to my Mom. I think it’ll help her understand my life better. I learned this theory from a patient a few years back and I’ve always used it with my auto immune/chronic pain patients to discussed energy conservation as I am an occupational therapist. However I know find myself on the other side of it being diagnosed with an auto immune disease of my own. I re read this and honestly I needed to remind myself to slow down because I so often push myself and pay for it later. I’m hoping this will also help my fiancé understand what I am going through. Hello. The spoons is great. I use this analogy for my chronic pain and my daughter uses it for the mental stress her autism causes. Finaly we have a way to communicate to the world about our struggle. Hi! I attempted to use the “contact us” setup, but my computer wouldn’t show the code, so I was unable to copy it. I am so very thankful for your spoon theory; this has reached an amazing amount of people. #2 if I could publish (and of course give you credit by name and website) your article in the planner itself.